Venous ulcers account for 80 percent of ulcers in the lower extremities. 1 out of every 100 people have an issue with venous ulcers, and they are often recurrent; open ulcers can persist from weeks to many years. Venous ulcers are more common in women than men, and are more likely to occur in older persons. Vein problems and hypertension of the veins are thought to be the primary mechanisms for ulcer formation. Contributing factors to having problems with veins can include not moving and being sedentary; ineffective pumping of the calf muscle; as well as venous valve dysfunction from trauma. Diagnosis is often straightforward and may only require a simple examination, but if the cause is unclear, a variety of tests are available, including ultrasound, ankle-brachial index, and venography. 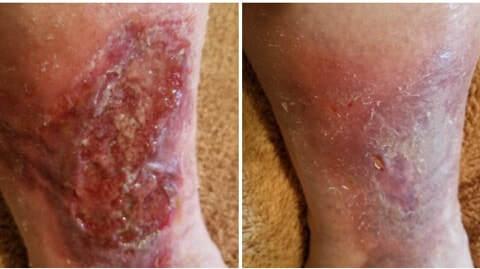 Venous ulcers often take the form of a painful ulcer located over bony prominences, particularly the gaiter area, which is the area extending from just above the ankle to below the knee. Compression therapy is a standard way to care for venous ulcers and chronic venous problems. Leg elevation can be used in combination with compression therapy. Dressings are often used with compression bandages to promote faster healing. Pentoxifylline (Trental) can help improve circulation, and has been shown to be an effective treatment when added to compression therapy. The role of surgery is to reduce venous ulcer issues, improve healing, and prevent recurrence. Options include endovenous laser therapy to close the dysfunctional veins, and sclerotherapy. Even after treatment concludes, patients should continue with compression treatment to help prevent recurrence.